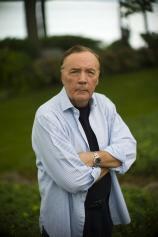 No one can legitimately accuse James Patterson and Maxine Paetro of not giving the readers of the Women’s Murder Club series their money’s worth. 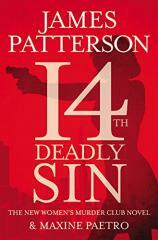 14th DEADLY SIN, the latest installment, seems to have enough action, twists, turns and plot lines for...well, 14 books. I’m not exaggerating here. Quite a bit goes on, yet never for a moment did I feel as if I was about to get lost in the intersection of one investigation with another. When two authors (never mind one) can pull off something like that, it’s the occurrence of another intersection, that being craftsmanship with experience. It shows in spades here. San Francisco homicide detective Lindsay Boxer is first among equals here, dealing with two major cases. The first involves the sudden, fatal and apparently random stabbing of a woman in a crosswalk by a seemingly nondescript assailant. Lindsay is in the middle of celebrating the birthday of San Francisco coroner Claire Washburn with newspaper reporter Cindy Thomas and Assistant District Attorney Yuki Castellano when she is called away from the party to investigate the murder. Prompted partially by a gentle admonition from Claire, Lindsay realizes this is the third time that someone has been murdered on Claire’s birthday, with the two previous crimes remaining unsolved. "Quite a bit goes on, yet never for a moment did I feel as if I was about to get lost in the intersection of one investigation with another." Meanwhile, a series of brazen holdups of check-cashing businesses and corner markets are being carried out by a team of armed gunmen wearing SFPD windbreakers and nondescript masks. These robberies have also involved homicides, and as a result, the San Francisco Police Department --- and Lindsay by extension --- is doubly pressed to find the team and put their actions to a stop, even as they wonder if the robbers are from their own ranks. Yuki is weathering her own quiet storm. Perhaps the most impulsive of the group, she resigns her position with the D.A.’s office to take a job with a non-profit victims’ rights group. Her first case involves bringing a wrongful death suit against the city of San Francisco on behalf of the family of a young man who they believe was charged on the basis of a coerced confession with the murders of some drug dealers and then killed while in prison. Yuki quickly finds herself in court, up against her old boss as well as one of the top defense firms in the city. Outmatched and outgunned, all she has going for her is...well, the evidence, and some help from an unexpected source. Two of these cases ultimately converge, while the third is solved with some help from a party outside of, but close to, one of the members of the Women’s Murder Club. All is resolved by the close of the novel...but a mysterious phone call at the end sets things up for what’s next. Many people consider the Women’s Murder Club to be Patterson’s best collaborative series. If you haven’t yet had the pleasure of sampling the canon, 14th DEADLY SIN is an excellent place to jump on. And while truly a book for all seasons, it may well be the beach read of this summer.